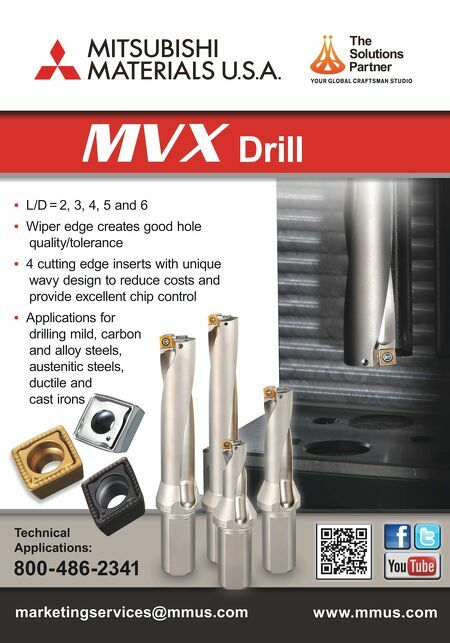 SHOP TALK MMS NOVEMBER 2018 50 mmsonline.com Industry News Amid a rapidly transforming industry, the 32nd edition of the International Manufacturing Show (IMTS) drew a record registration of 129,415 people and featured 1,424,232 square feet of exhibit space representing 2,123 booths and 2,563 exhibiting companies. The show ran September 10-15 at Chicago, Illinois's McCormick Place. 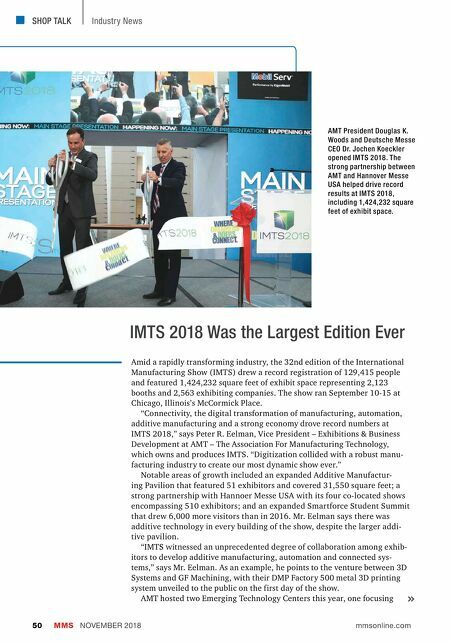 "Connectivity, the digital transformation of manufacturing, automation, additive manufacturing and a strong economy drove record numbers at IMTS 2018," says Peter R. Eelman, Vice President – Exhibitions & Business Development at AMT – The Association For Manufacturing Technology, which owns and produces IMTS. "Digitization collided with a robust manu- facturing industry to create our most dynamic show ever." Notable areas of growth included an expanded Additive Manufactur- ing Pavilion that featured 51 exhibitors and covered 31,550 square feet; a strong partnership with Hannoer Messe USA with its four co-located shows encompassing 510 exhibitors; and an expanded Smartforce Student Summit that drew 6,000 more visitors than in 2016. Mr. Eelman says there was additive technology in every building of the show, despite the larger addi- tive pavilion. "IMTS witnessed an unprecedented degree of collaboration among exhib- itors to develop additive manufacturing, automation and connected sys- tems," says Mr. Eelman. As an example, he points to the venture between 3D Systems and GF Machining, with their DMP Factory 500 metal 3D printing system unveiled to the public on the first day of the show. AMT hosted two Emerging Technology Centers this year, one focusing IMTS 2018 Was the Largest Edition Ever AMT President Douglas K. Woods and Deutsche Messe CEO Dr. Jochen Koeckler opened IMTS 2018. The strong partnership between AMT and Hannover Messe USA helped drive record results at IMTS 2018, including 1,424,232 square feet of exhibit space.